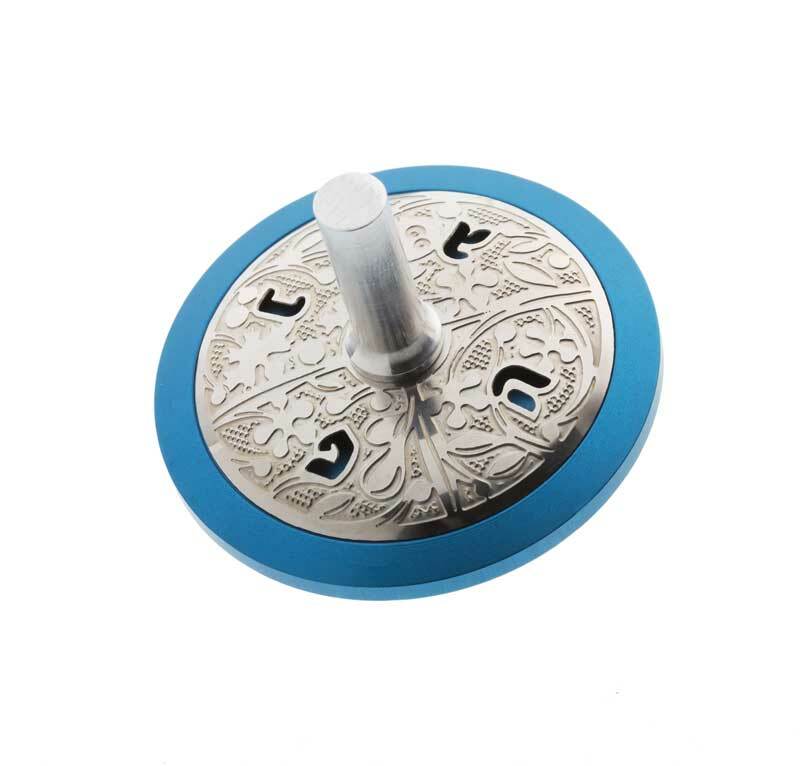 This blue and silver colored Hanukkah dreidel in the form of a circle is a product of the workshop of famous designer Lev Shneiderman. Exquisite design and precise workmanship are typical for his work, and this beautiful small Judaica is a perfect example. Hanukkah dreidels have been present in the Jewish tradition for ages. They have been produced in a variety of forms, and thus became collectors' items. This circle Hanukkah dreidel is an example of exquisite design and definitely worthy to be a part of the Judaica collection of a selective collector. Blue circle and silver Aluminum cover with floral ornamentation create beautiful harmony. Four Hebrew letters cut out on the cover are typical for Israeli dreidel. The letters Nun, Gimel, He and Pei create the acronym “Nes Gadol Haya Po” (meaning: a big miracle happened here). Spinning Hanukkah dreidel is a game traditionally played during the holiday of Hanukkah. Except for the meaning in the game, the letters on dreidel refer to the miracle occurred in the Land of Israel. This small work of art is a creation of designer Lev Shneiderman. He is well known for his exquisite designs, recognized also by the President of Israel and the Israeli Knesset.